We’re proud to provide reupholstery services to numerous educational establishments throughout the South East, predominantly in Berkshire, the M4 corridor and London. 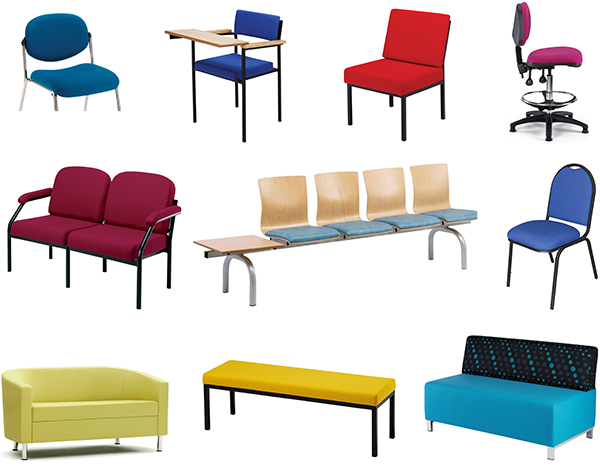 Seating in schools, colleges and universities under goes very heavy use resulting in worn, tired, damaged and uncomfortable seating that is no longer fit for purpose. Seating is always a significant investment and the structural components of chairs often outlive the fabrics and foams. Reupholstery allows you to extend the life of your seating and save up to 80% against the cost of buying new furniture. We only use the highest quality fabrics suitable for the demands of the education sector, we often recommend Camira’s 24/7+ fabric for heavy use student areas. It’s a heavy duty upholstery fabric designed and coloured to withstand the rigours of 24 hour round the clock usage with a clean, sharp finish and guaranteed for 10 years. Request a no obligation site survey today. In addition to traditional upholstery fabrics we also reupholster using the latest antimicrobial and antibacterial fabrics such as Sunbury Designs Nappa Aquaclean range – a faux leather collection with superb stain resistant properties. Drink spills such as red wine and beer, food, biro and even permanent marker can be removed by simply cleaning with water. Nappa is fully certified for severe contract upholstery use. Fire retardant to BS 7176 Medium Hazard, durability to 250 000 Martindale rubs and 100% eco friendly, meeting Oeko-Tex Standard 100. And as if that’s not enough it also incorporates a ‘Safe Front Hygiene Protector’ which prevents the presence of dust mites, fungi and bacteria. We stock mechanical parts from all leading manufacturers and in many cases, we can make economical repairs to chairs which may have been considered a write off. We can replace castors, chair bases, arm pads, feet and much more. We provide a free collection and delivery service within a 50 mile radius of Reading in Berkshire. We realise that its not always convenient to release a quantity of chairs for renovation so can offer a quick turnaround during holidays. We’d be delighted to visit your site and survey any seating requiring attention – we then provide a no obligation quotation, request a site survey here. Alternatively you can email us a photo of an individual chair and we can provide an estimate.